Today was one of those mornings – the alarm was set early as we were planning to visit Winchester Christmas Fair and catch the early train. One of our cats decided differently and in the middle of the night we had cause to drive into Farnham to visit the Emergency Vet; thankfully ‘Joseph’ is fine now but needs monitoring for at least 24 hours. As I was up early to check on Joseph I decided to cook my husband a breakfast using up odds and ends which were in my fridge, basing the recipe along similar lines to one I knew my husband loves – Iranian Lentils, Peppers and Egg. Grate ginger and stir into vegetables along with the cheese. Heat the oil in a fry pan and spread out the vegetable mix. Sprinkle generously with cayenne pepper. Break two eggs on top. Gently cook for about 15 minutes until eggs are set to your liking. By this time, the vegetables will also be nicely cooked. Slide on to a plate and serve immediately. Any leftover vegetables would probably suit this dish, especially a chilli or two or some fresh herbs, but the end result – in my husband’s words – was a “melody of taste” and could he please have it again!! 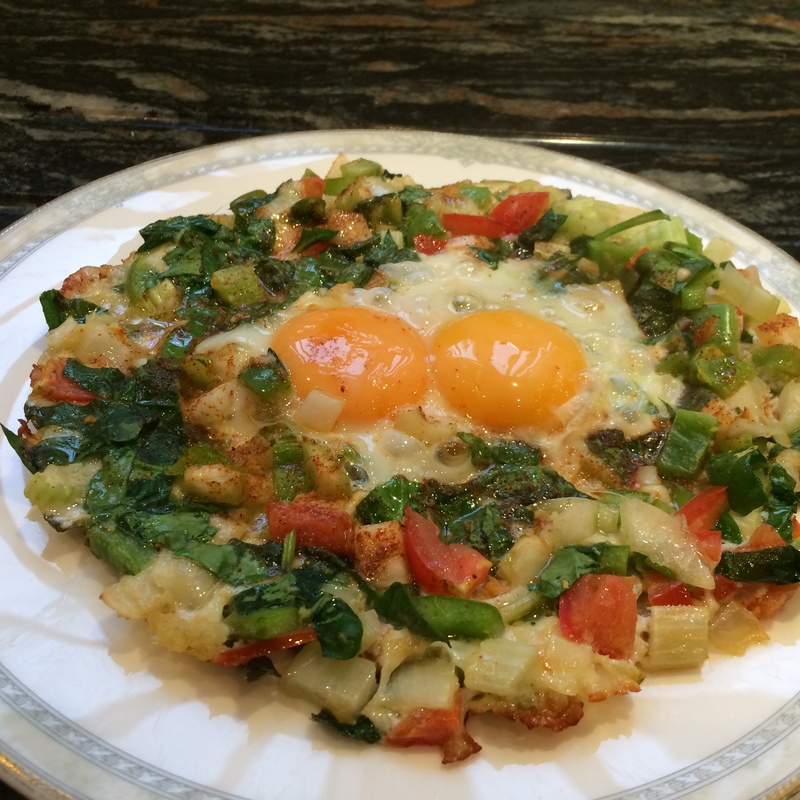 This entry was posted in Breakfast, Brunch and tagged Breakfast, Egg, Gluten Free, Healthy Eating, Peppers, Vegetables. Bookmark the permalink.